Performance Philosopher. Teacher. Grief Worker. These publications demonstrate a concerted effort to think historically, creatively, and critically about the social roles of theatre and performance practices across multiple times and spaces. The sum total of these works is less a laser-like research portfolio and more a constellation of gestures aimed at shining light onto the terrains of theatre historiography and performance philosophy. This star over here illuminates the world of Baroque Venice. This one shows us Theodor W. Adorno's contributions to the act of philosophizing. That one limns the potentials of experimental philosophy. Baroque, Venice, Theatre, Philosophy. Basingstoke, UK: Palgrave, 2017. Performance Philosophy Series. If you have heard of the Baroque, then you have probably heard of the eye-popping effects conjured by Baroque visual artists, the interplay between light and shadow on the façades of Europe's great Baroque architectural masterpieces, the moving scenery of Baroque opera, or the inventive fusion of scripted and improvised music made possible through Baroque thoroughbass. But what about the idea of a Baroque social practice. What would that look like? In this book, I maneuver through centuries of writing on Baroque aesthetics, mine Venetian archives for traces of public executions and signs of civil discontent, and think through relevant medieval and contemporary philosophical concepts in order to paint a picture of this Baroque social practice. Such a thing, it turns out, is linked intimately to theatre, theatricality, and the performance of self. To develop the nuances of this practice, I push together two entities that seem at first to be entirely opposite of one another: The Jesuits (militant arm of the Counter-Reformation Catholic Church) and Ruzzante (political performer faithful above all else to his native home of Padua). The sparks resulting from the collision of these entities illuminates a vast terrain of literature, theatre, governmental disciplinary procedures, and acts of protest in the 16th and 17th centuries. Will Daddario and Karoline Gritzner, eds. 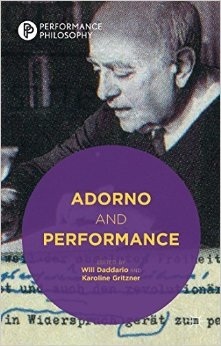 Adorno and Performance. Basingstoke, UK: Palgrave, 2014. Performance Philosophy Series. Full Text of “Introduction" available here. Laura Cull and Will Daddario, eds. Manifesto Now! Instructions for Performance, Philosophy, Politics. Bristol, United Kingdom: Intellect, 2013. Manifesto Now! maps the current rebirth of the manifesto as it appears at the crossroads of philosophy, performance and politics. While the manifesto has been central to histories of modernity and modernism, the editors contend that its contemporary resurgence demands a renewed interrogation of its form, its content and its uses. Featuring contributions from trailblazing artists, scholars and activists currently working in the United States, the United Kingdom and Finland, this volume will be indispensible to scholars across the disciplines. Filled with examples of manifestos and critical thinking about manifestos, it contains a wide variety of critical methodologies that students can analyse, deconstruct and emulate. What is Refugee? Will Daddario, Janhavi Dhamankar, Milton Loayza, Jon McKenzie, Yana Meerzon, Tero Nauha, Theron Schmidt, Aneta Stojnić. Performance Philosophy 4.1 (2018): 206–233. Introduction: Crisis and the Im/possibility of Thought. Will Daddario and Theron Schmidt. Performance Philosophy 4.1 (2018): 1–8. The ubiquity of "crisis" and its sheer pervasiveness as a description of the contemporary world means that we do not so much write about crisis as much as we write from crisis. What type of thought is possible within crisis? If crisis extends to thought itself, insofar as we find ourselves in a crisis of thought (i.e., the crisis of not being able to think beyond the crisis of thought), then what kind of thinking is possible anymore? These are the questions raised by this special issue of Performance Philosophy, introduced here by the issue's co-editors. ‘Concentrated, Polysemous, Literary Act’: Every House has a Door Reads Jay Wright’s Three Matadores Play. Contemporary Theatre Review 28.2: 179-195. This essay analyzes a performance called The Three Matadores Play by Every house has a door. As part of the group’s mission to bring attention to historically or critically neglected subjects, Every house chose this play to bring attention to the text’s originator, African-American poet Jay Wright. Located within Wright’s long-form poem The Presentable Art of Reading Absence, the matador play meditates upon death, rebirth, and ontological uncertainty, themes that run through the rest of the poem and indeed through Wright’s body of work. I argue that the directorial, scenographic, and dramaturgical choices made by Every house in their staging of the text help to reveal the deep structure of Wright’s poem, a structure that is itself dramaturgical insofar as it supports a view of language as both performative and world-generating. To reveal the group’s performance tactics and Wright’s multilayered poetic imagery, I parse the polysemous nature of the poetic text and performance staging. Ultimately, I forward the claim that Every house’s production constitutes a productive ‘reading’ of the philosophical propositions forwarded by the play. This ‘reading’ is possible only by embodying the text and actively inviting attentive spectatorship. This essay served as the reading companion for the World Premier of The Three Matadores Play by Chicago-based performance group Every house has a door. Its purpose is to welcome readers into the startling vivid and complex long-form poem by Jay Wright that served as the motivation for this staged work. The essay will be accompanied by another piece titled, "'Concentrated, polysemous, literary act': Every house has a door reads Jay Wright," which elucidates the dramaturgy of both Wright's poem and Every house's performance. Stay tuned for new about that. In the meantime, if you are interested in reading a copy, contact me through the contact page on this site, send a mailing address, and I will mail you one. “Adorno’s etudes: Excessive Exactitude and ‘Having Crossed.’” The European Legacy 21.7 (2016). "Adorno's Cultural Praxis: A Current Perspective." 705-720. From Peter Zazzali's (ed.) introduction: "Will Daddario’s 'Adorno’s Etudes: Excessive Exactitude and "Having Crossed"' concludes our Special Issue with a unique essay that is modeled on its subject, the etude. His essay stages an encounter between Adorno’s thoughts on art and philosophy. Daddario focuses on two 'monumental' works of art that frame Adorno’s philosophical praxis, developing a complex analysis of the dialectal relationship between the visual and the conceptual, the actual and the virtual, and the myriad ways in which concrete objects present themselves in public display. The result is an article that ‘enacts’ itself, a performance of sorts, exploring Adorno’s thought process as expressed in the tension between artistic creation and the commodifying forces of the culture industry." Co-authored with Joanne Zerdy. “Bootleg Education: Parapedagogical Experimentation Outside the University Setting.” Theatre Topics vol. 25 no. 1 (March 2015): 77-87. From September to December 2012, we facilitated what we called a “bootleg class on listening” with former and one current University of Minnesota students. Although not explicit at the time, we have come to realize that during those months we were working in tandem with Stuart McLean’s and Oscar Wilde’s notion of “performing new realities into being.” Our class retained some familiar elements of university education: students/learners, teachers/facilitators, assignments given and completed, group discussions. However, as we will elaborate, we aimed to place on equal footing with the content of our class the self-reflexive processes of thinking about thinking and learning about learning so as to help students and facilitators alike to close the gap between who we were and who we might become. The following pages present “Bootleg: On Listening” as an argument for creating parapedagogical encounters outside, and in parallel position to, the University. To borrow from playwright Naomi Wallace’s manifesto “On Writing as Transgression,” transgressive learning is learning “that encourages students to write against their ‘taught’ selves and to engage, as bell hooks puts it, in the kind of ‘self-transgression’ and ‘critical awareness of self’ that will enable them to become, as John Donne suggests, ‘citizens of the world’” (100). Our claim is that emancipatory teaching and learning, what Wallace and hooks, refer to as transgressive learning, is now only possible through a feedback loop in which the discipline of academia informs experimental investigations away from codified institutions, which, in turn, generate insights that filter back into and refresh the discipline of academia. Co-authored with Wade Hollingshaus. “Performance Philosophy: Arrived Just in Time?” Theatre Topics vol. 25 no. 1 (March 2015): 51-56. The argument that we would like to forward here and through the articles collected in this journal is that teaching theatre and performance within the institution of higher education in the United States today will benefit from a renewed attention to philosophical practice. At the same time, in step with the guiding ethos of performance philosophy (as articulated in brief above), we claim that neither performance nor philosophy means any one thing; that our understanding of both terms will become enriched by starting from a position of not-knowing and then preceding, through experimentation, to an enriched and rejuvenated understanding of each; that our students learn precisely through our ability to go along on such experiments with them. Those claims form, collectively, the carrot. Now here is the stick: administrative emphasis on learning outcomes has diminished our willingness to experiment and embark from places of not knowing. Templates of acceptable scholarship structure the majority of articles we read in our top journals, and, by extension, those same templates guide our thought and shape our ideas when we write articles intended for publication. The remedy: look for new forms in the classroom, in our writing, and in the language that we use to articulate our worth to the administration. These new forms abound in the scholarship coming out of the new field called performance philosophy, and we want to introduce some of these forms to you here so that we all can cultivate philosophically rigorous pedagogical environments. To Grieve. Ugly Duckling Presse, 2017. What does it mean to grieve rightly? Might there be such a thing as an ethics of grief, a practice of turning my full attention to the specificity of each loss so as to carry such loss in me and to become, in the words of Gilles Deleuze, worthy of what has happened to me? To Grieve answers these questions through the author’s personal and philosophical ruminations following the sudden deaths of his son, father, step-father, friend, grandmother, and cat. Attending specifically to the ways in which grief-space appears, grief-time imposes itself, and grief-language bends itself around the emotional acuity of the wound, this long-form essay nestles up against the unnamable and pauses to measure its heft. Performance Philosophers seek to think anew, not only for the fun of it but also to destroy (or at least artfully ignore) the well-tended perception that thinking must unfold in a certain way, through specific channels, and with the legitimacy bequeathed to thought (i.e., commodified thought; a kind of thought that might be trademarked) through validated keywords and slogans. For these reasons, Performance Philosophers seek to think the doing of life, with the expectation that to do so would mean to live a life worthy of the name. This manifesto elaborates on these claims and calls for the creation of an Invisible College through which we might express the potential of performance philosophy. Co-authored with Ioana Jucan. “On Doing Performance Philosophy.” Translated into Chinese for Yu Jiancun and the Shanghai University of the Arts Journal Theatre Arts as 表演哲学. Also published in English by Yu in the French journal Confluent. 2015. Co-authored with Wade Hollingshaus. “Emancipating Dramaturgy: From Pedagogy to Psychagogy.” Review: The Journal of Dramaturgy vol. 23 no. 1 (Spring 2013): 10-19. Co-authored with Megan Lewis. “Hyperthinking through Theatre History: Haiti, Hotel California, Woyzeck, Hegel and Back Again.” Theatre Topics vol. 22 no. 2 (September 2012): 183-194. “From Pseudo-Activity to Critique: Adorno, Philosophy, Participation.” Eds. Laura Cull and Karoline Gritzner. On Participation. Special Issue of Performance Research vol. 16 no. 4 (December 2011): 124-135. “A Public of One: Baroque Jesuit Discipline in the Theatre of the World.” Ed. Kevin Wetmore. The Great Stage of the World: Roman Catholic Life and Performance. Special Issue of Ecumenica: A Journal of Theatre and Performance vol. 4 no. 1 (Spring 2011): 13-26. “Parable to Paradigm to Ideology: Thinking Through (the Jesuit) Theatre.” Journal of Dramatic Theory and Criticism vol. 25 no.1 (Fall 2010): 29-40. “Adorno, Baroque, Gardens, Ruzzante: Rearranging Theatre Historiography.” Theatre/Performance Historiography: Time, Space, Matter. Eds. Rosemarie Bank and Michal Kobialka. London, England: Palgrave, 2015. The questions that frame the discussion of theatre and performance historiography today often concern its relationship to the cultures performing it and the thought processes it expresses. This volume draws attention to and investigates a historiography whose function is to be a mode of thinking, a model of action within the existing real. These essays address how theatre/performance historians analyze the historiographical methodologies that have been used to write theatrical and performance histories, how they resituate theorizations of the archive, of periodization, and of the past within theatre/performance research. As a result, the focus of this volume is not on the way reality is experienced by an historical subject, but how the reality of time, space, and matter mediates historical subjects. This exploration exposes the inner contradictions in the social and ideological organizations of history by establishing a different way of thinking about historiography, one which presents a challenge to current social organizations of and ontologies about historical subjects. Co-authored with Joanne Zerdy. “When You Are What You Eat: Ruzzante and the Metabolism of History.” Food and Theater on the World Stage. Eds. Dorothy Chansky and Ann Folino White. New York, NY: Routledge, 2015. Putting food and theatre into direct conversation, this volume focuses on how food and theatre have operated for centuries as partners in the performative, symbolic, and literary making of meaning. Through case studies, literary analyses, and performance critiques, contributors examine theatrical work from China, Japan, India, Greece, Italy, France, Germany, England, the United States, Chile, Argentina, and Zimbabwe, addressing work from classical, popular, and contemporary theatre practices. The investigation of uses of food across media and artistic genres is a burgeoning area of scholarly investigation, yet regarding representation and symbolism, literature and film have received more attention than theatre, while performance studies scholars have taken the lead in examining the performative aspects of food events. This collection looks across dramatic genres, historical periods, and cultural contexts, and at food in all of its socio-political, material complexity to examine the particular problems and potentials of invoking and using food in live theatre. The volume considers food as a transhistorical, global phenomenon across theatre genres, addressing the explosion of food studies at the end of the twentieth century that has shown how food is a crucial aspect of cultural identity. (Forthcoming 2017) “What a Joke: Ruzzante’s failed attempt at the Good Life.” 'Fail Better, Fail Again!' Performance, Theatre and the Philosophy of Failure. Eds. Eve Katsouraki and Tony Fisher. New York, NY: Routledge. This chapter’s analysis of failure begins with an investigation of the third- or fourth-rank definition of ‘joke’: not something said or done to evoke pleasure or amusement, neither a mischievous trick nor a ludicrous situation, but, rather, a failed attempt. The apt phrase of reference in this case would be, ‘what a joke.’ Further refining this definition, I understand failure as a practice capable of preserving a historical image through the negation of a particular ideology. Visiting the theatre practice of Ruzzante, aka Angelo Beolco (c.1502 – 1542), I excavate the depths of his lewd humor. Fixed in the pages of his existing plays, the entries of Venetian diarists, and the secondary literature on the Paduan performer, Ruzzante’s humor fashions a viewpoint onto a performance practice dedicated to up-ending the worldview of the upper classes, especially that of Alvise Cornaro (1484 – 1566), under whose patronage Ruzzante created many of his plays. Ruzzante did not tell jokes as much as he perpetually demonstrated the joke that was his life. Parsing that joke, articulated here as a failed attempt to attain the pseudo-Epicurean Good Life touted by Cornaro, develops the historical image of the social world in which Ruzzante lived, and furthers the recent scholarship that understands failure as a socio-political and cultural practice.